Agreements related to family law are known by a variety of names, including postnuptial agreements, marital settlement agreements, and property settlement agreements. These agreements differ from prenuptial agreements, which are entered into prior to marriage. Regardless of the specific type of family law agreement, their purpose is to delineate the rights and obligations of the parties and resolve as many differences as possible, and they often pave the way to a less stressful divorce. Our family law attorneys have extensive experience drafting and negotiating the full range of these agreements, including prenuptial and postnuptial agreements, which are increasingly commonplace and constructive tools to plan for the future, regardless of your age, profession, wealth, or parental status. Our family law attorneys assist clients throughout Southwest Florida with the preparation, review, and execution of these arrangements. The unfortunate reality is that a significant number of marriages in this country end in divorce. Prenuptial and postnuptial agreements provide a valuable method to protect your future. 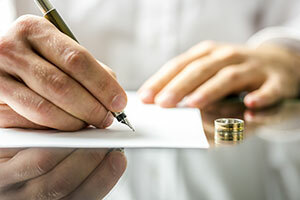 When faced with divorce or the death of a spouse, having a carefully considered and legally binding prenuptial or postnuptial agreement in place can make all the difference for your future. Our family law attorneys possess both the knowledge and skill to ensure that you are treated fairly, the interests of all parties involved are legally protected, and the agreement is enforceable. If legally appropriate, our family law litigators will aggressively defend or attack the legitimacy of these agreements. Our family law department collaborates with other practice groups in our firm to provide comprehensive legal services in the areas of taxation, real estate planning, and other fields integral to prenuptial and postnuptial agreement matters. Raising the issue of a prenuptial or postnuptial agreement can be both highly emotional and legally complicated. For compassionate guidance, enhanced representation, and peace of mind, contact us today to speak with a skilled family law attorney.